A brighter future is in your hands. We’re currently seeking a Production Manager (PM). The Production Manager (PM) schedules and directs personnel and resources towards providing quality, cost-effective services to clients. PMs also support the Account Manager in estimating and budgeting as needed. Understand client needs via regular communication with the Account Manager. Ensure that job site quality and appearance meet client and BrightView standards. 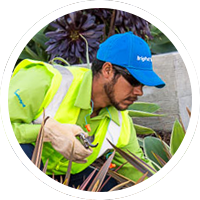 Manage all landscape services, including the coordination of all materials, people, equipment and subcontractors required to produce quality work. Inspect properties prior to scheduled service in order to properly prepare specific action plan for service. Adjust schedule as needed and follow up. Monitor irrigations systems, identify problems or necessary repairs, and communicate recommendations to the appropriate party. Monitor all aspects of the landscape and identify insect or disease problems. As necessary, perform hands-on work with crews to meet work and scheduling demands. Implement and enforce BrightView policies and procedures related to proper upkeep and maintenance, storage, use, and training required for branch equipment. Work with the Account Manager to identify staffing needs, hire new crew members, and prepare daily crew schedules. Ensure proper paperwork is completed for all employee changes and hires. Communicate with, counsel, train, discipline, review, and develop growth plans for employees. Hands-on training and support of crew members, including proper operation of equipment, pruning techniques, safety, and quality standards. Focus on safety and monitor safety records. Maintain and manage all required paperwork. Coordinate with Branch Administrator to ensure branch databases are consistently updated with current client information. Order materials as needed and monitor costs and deliveries. Request purchase orders and use in accordance with company guidelines. 2-4 years of prior working experience in the landscaping industry or local marketplace. 1-2 years prior experience in a supervisory role. 2 or 4 year degree in a landscape-related field or certification by a landscape association preferred. Ability to coach and develop teams.